Richard Hunt was born in 1951 at Alert Bay, British Columbia, into a family of internationally respected artists, including his father Henry and his grandfather Mungo Martin. Richard Hunt began carving with his father at the age of 13. In 1973, he began work at the British Columbia Provincial Museum in Victoria as an apprentice carver under his father. The following year he assumed the duties of chief carver in the Thunderbird Park carving program. He remained at the museum in that capacity for 12 years. In December 1986, Mr. Hunt resigned this position and began a new career as a freelance artist. Richard Hunt has played a leading role in the renaissance of Northwest Indian art. It is a rebirth that has spread throughout North America and influenced indigenous art around the world. A master carver, experienced ritualist and dancer, Richard Hunt has created a diverse body of art that contributes much to the preservation and perpetuation of Kwa-gulth culture and traditions. His totems, prints, drums, masks and bowls are the pride of museums and private collections around the world. He has also communicated his art and culture, in talks to students, from preschool to university level, and museum visitors who watched over the years as he worked. 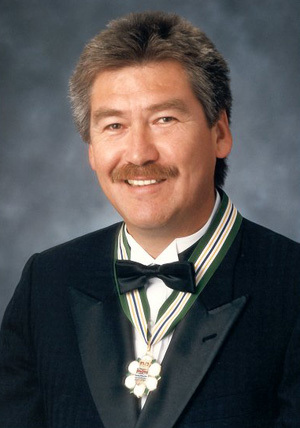 Outside Canada, Richard Hunt has been an effective ambassador for native people, for British Columbia and Canada. Richard Hunt’s Indian name – ‘Gwe-la-yo-gwe-la-gya-les’ – means ‘a man that travels around the world giving’. Through his art, Richard Hunt has indeed given much. He is a man possessed of enormous reserves of energy and has dedicated his creative talents towards furthering the cultural ambitions of the Kwa-gulth people.